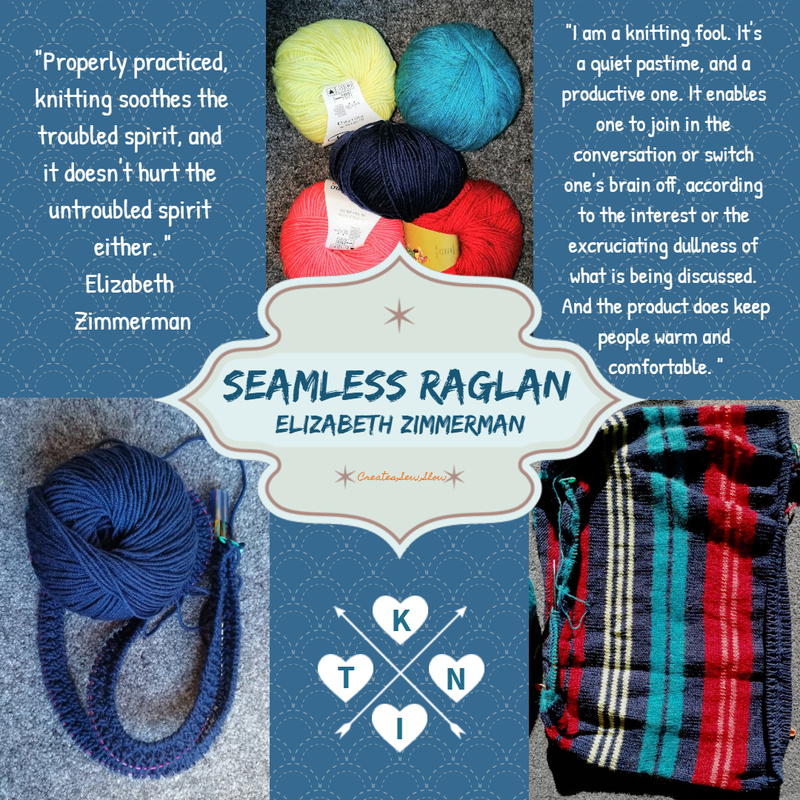 Having not knitted anything since Winter 1996 I decided to join Fabrickated's knit along of the Elizabeth Zimmerman (EZ) Seamless Raglan jumper. The whole idea of having very little to sew-up at the end of the knitting was appealing. 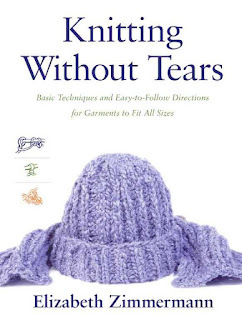 I have always felt that the finishing at the end was what made my knitted garments look amateurish - loving hands at home - and not in a good way. It is perhaps a statement in itself that none of the knitted garments I laboured over in the past are still residing in the wardrobe. Even though they were timeless garments and many I would consider knitting again for my lifestyle today. Before the knitting came a slow laborious period of choosing the yarn. 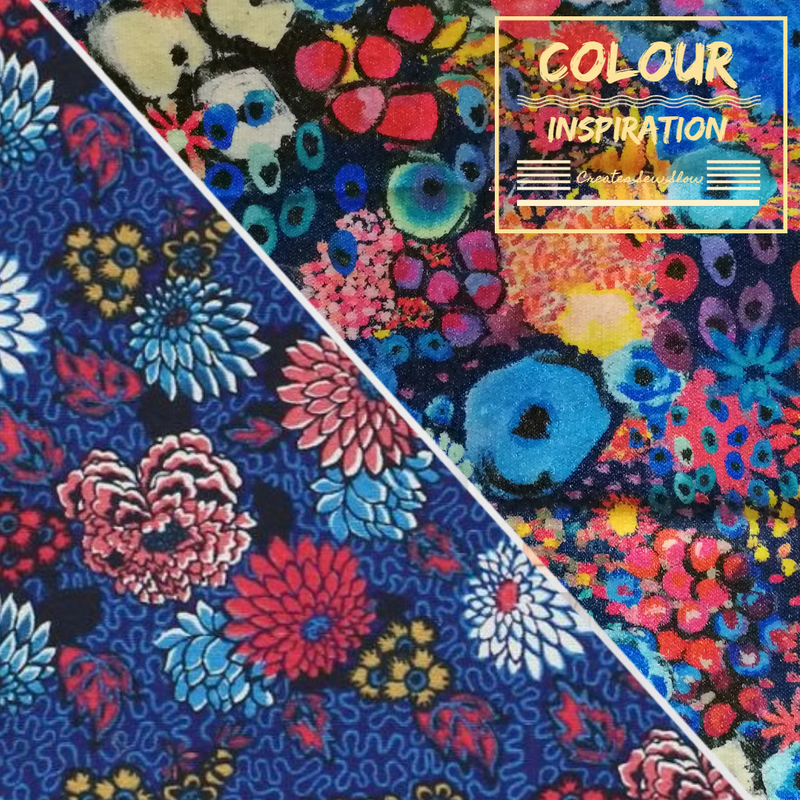 I was quite fixed on the colour palette I wanted - perhaps that was my mistake. A bit like when you go shopping for your Christmas party dress determined it won't be black again only to trail home despondent with another black dress. Eventually I found four of the five colours (in the same yarn weight) at The Main Skein in Christchurch. The bright yellow proved too elusive so I eventually settled on a pale yellow purchased at Nancy's Stitch Studio in Wellington. So the knitting process started on 16 June 2018 when armed with my lovely merino 8 ply (double knit) wool I did a test swatch. The next step was calculating the number of stitches to cast on for the size I wanted. Another disappointing aspect of my knitting is the casting on - the end product is quite tight with no give. This led me to research casting on techniques, of course via YouTube. I discovered Judy's Magic Cast-on with Judy Becker, along with Tubular Cast-on with Lorilee Beltman. The instructions for knitting the Seamless Raglan Sweater come from Elizabeth Zimmerman's book Knitting without Tears. Largely this is true but I am having difficulty with the jogs where the stripes change colour, despite having watched many a YouTube clip. 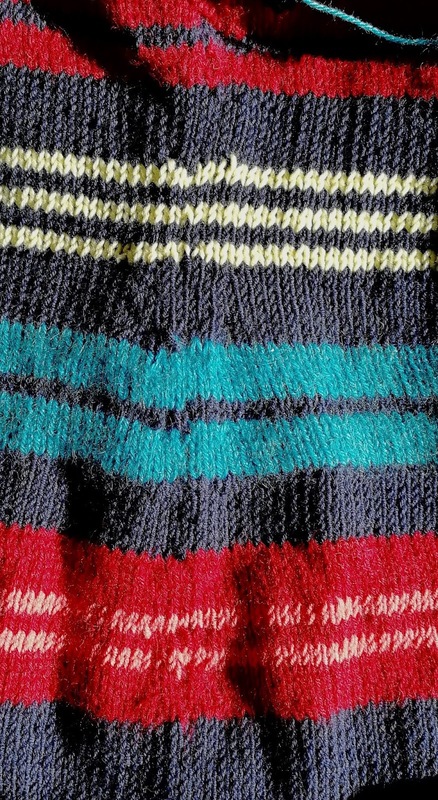 I realise that some of this will even out when the finished jumper is blocked but still it is pretty ugly. The stripe jog occurred at a "side seam". I find that garments with a bit of shape suit me better and I carefully decreased at the equivalent of the side seam up to the waist then started increasing as I knitted up to the bust. Given I can't just appropriate the start of the row as the cutting part of the steek what now? Well all those rows of knitting could be treated as practice and I could go back to the beginning. The joy of knitting is that you can go back to your raw ingredient (the ball of wool) and start again. So I did. Having reached about two thirds of the way to the underarm the jumper has been un-knitted to the start of the first red stripe. In the reborn jumper, aka the striped cardigan, my steek section will contain seven stitches (first four stitches of a row and the last three). Once the jumper is cut to make the cardigan the stitches in the steek section will naturally roll to the inside. I will mark my side seams after a bit of careful maths to deduct the steek stitches. This will indicate where to decrease / increase for the jumper shaping. Then let the knitting commence (again). As I carefully undid my knitting my beloved filled me with great confidence as he said "your not a knitter just stick to sewing bits of cloth". I may not yet be a confident knitter but I am stubborn. Plus I have the words of my Latin teacher to bolster my confidence, "oh well at least you can do something" were her immortal words as she held my knitting aloft scrutinising it carefully. Just to show I can knit when the urge strikes, here are the last three garments I knitted - way back in 1996. These jumpers were knitted sooo long ago that I have actual photographs of them! This was back in the day when I kept a me made photograph album of my embroidery projects, supplemented every now and then with a different craft. It is interesting to note that 1996 was our first winter here in New Zealand and we rented an old 1920's brick house with open fires (one in the lounge and one in the kitchen/dining room). We got to experience first hand how bad heating and insulating in NZ homes can be. There were occasions when it was warmer outside. I spent much of the winter trying to stand in the open fire because the heating effect was so ineffective even a few inches away. Maybe a slight exaggeration but I had been used to well insulated centrally heated homes for pretty much my entire life before this and it was a very traumatic experience. 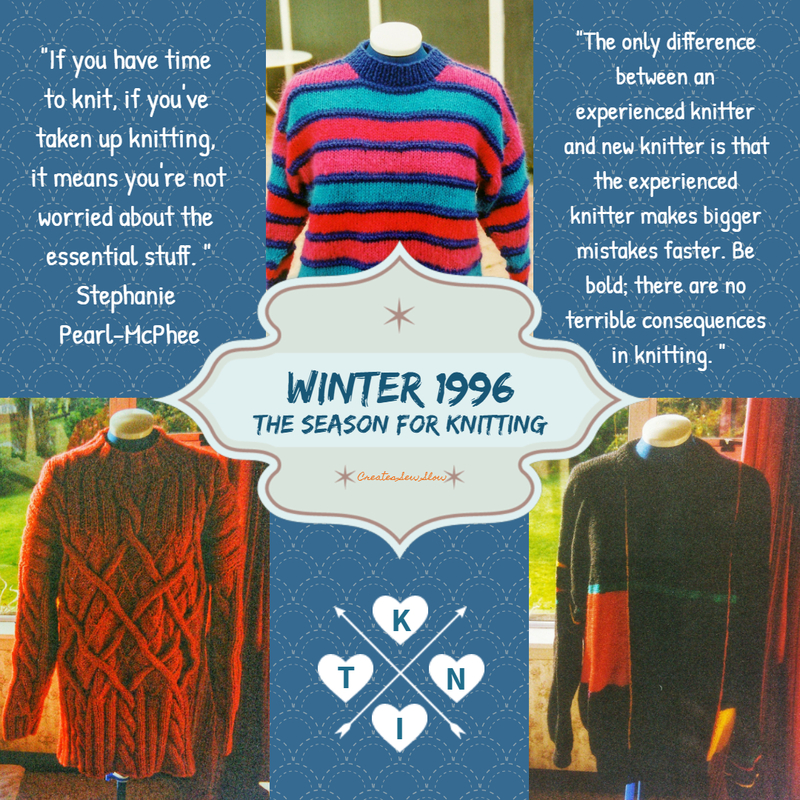 Was it this cold environment that led me to be such a prolific knitter that year? 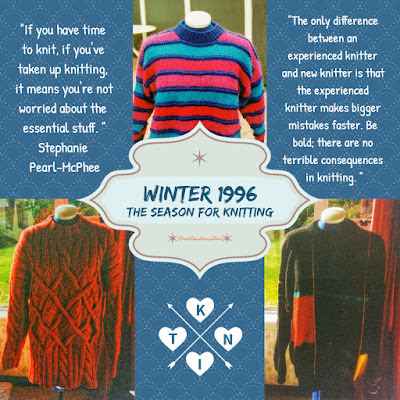 The jumper on the bottom right was started in 1990 whilst the others were started and finished in 1996 - admittedly the one top centre was for a child. I really love the red cable jumper from an old old issue of Vogue Knitting - if only the wool had been soft and cuddly instead of harsh and scratchy. 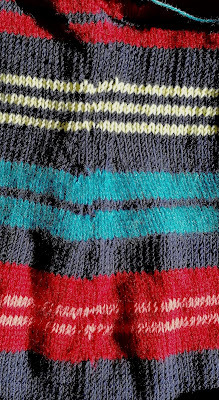 Maybe if I finish the striped EZ seamless raglan and make my beloved his long promised jumper I can knit the cable jumper again in better wool. And it is thoughts like these that make it all spiral out of control. Especially as there are many other knitted garments on my wish list - I have always wanted to knit the Kate Davies' Owligan or even the jumper version. It's interesting how the desire to knot never quite goes away. I seem to have had a resurgence in enthusiasm for knitting this year. Although committing myself to 2 fairisle cardigans may kill the enthusiasm. 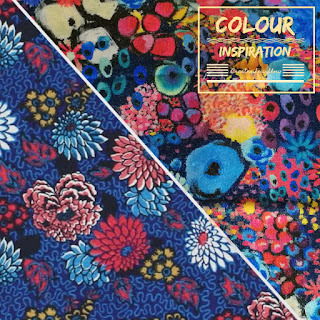 The steek idea is good and the decision to unknit and start again the right one. Love the Owligan cardigan. 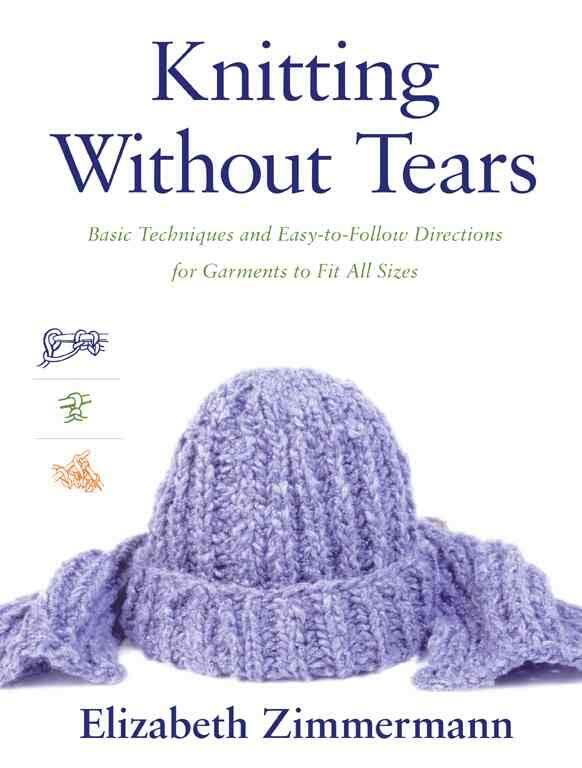 Very tempted to add that to my knitting queue as well.